For detailed information on living shorelines, see Appendix 10 of the Regional Strategy 2018. A living shoreline refers to a shoreline with natural elements, such as beaches, marshes, oyster reefs, and eelgrass beds, that is designed to restore habitat as well as help in physically protecting the coast from the effects of large storm events and sea-level rise. This can be alone or in combination with hard structures such as levees and seawalls. Living shorelines could be useful shoreline protection elements in situations where infrastructure is removed for habitat restoration purposes. While living shorelines often rely on the planting of native vegetation, sometimes other less natural materials such as stone sills, coir logs, oyster reef elements such a “reef balls” or shell material, or grounds are included to further reduce wave energy or trap sediment. 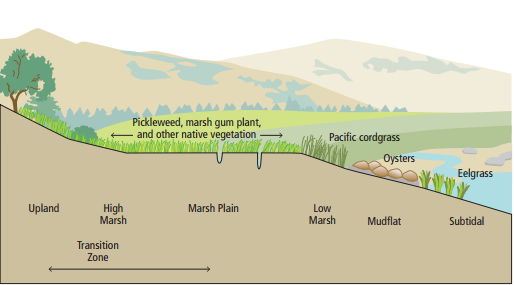 To date, California has implemented native Olympia oyster reefs, eelgrass beds, tidal wetlands revegetation, upland ecotones, sand beaches, and coastal dune restoration projects as living shorelines. The California State Coastal Conservancy has funded several living shoreline projects in Southern California including the Upper Newport Bay Living Shoreline Project (oyster and eelgrass restoration) and the San Diego Bay Native Oyster Restoration Project. Other potential habitats include coastal islands and boulder fields, kelp forests and other types of seaweed beds, rocky intertidal areas, and coastal bluffs as appropriate to the local geomorphology and ecology. However, Southern California is highly urbanized with one of the most hardened coastlines in all of the United States, and space is limited. Living shoreline projects will need to be coupled with the managed removal and realignment of built infrastructure to provide the space needed for coastal ecosystems to function properly. Sediment spraying at Seal Beach National Wildlife Refuge. Picture courtesy of USFWS.